Pros Extremely durable. Lightweight, huge (nearly 20" x 30"), expands easily. 360-degree wheels make turning easy. Cons Because this can hold so much, it is easy to overpack and exceed airline weight limits. Summary A fantastic suitcase that costs a bit more than competitors but is worth the expense. Easily the best of the best. Pros Perfect size for a checked bag as it will not exceed airline requirements. Light. Cons Needs a tougher shell, as the glossy polycarbonate will dent and scuff easily. Summary Offers decent hardshell protection to your items and is a perfectly sized checked bag. Price is a bit high, though. Pros Very easy movement. This 26" x 17.5" bag expands to a massive 18" deep. Cons Zippers tend to break and they are not covered under warranty. Summary The weak zippers are problem, but be careful with them and you will be rewarded with a great suitcase that can hold a lot. Pros Some of the best wheels on luggage to be found, generous 25" x 19" size. Cons Tends to fray over time, and the zipper pulls can break under heavy force. Summary Some minor construction problems have been reported, but this suitcase is a solid performer available for a competitive price. 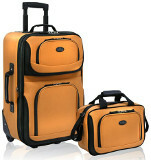 Pros A ridiculously low price for a durable, two-piece set of luggage. Lots of color choices, too. Cons At 21" x 13.5", the larger bag is a bit small. Summary Durable and inexpensive, this is a great two-piece set. You can carry on both pieces, which means even the larger bag has limited packing space.